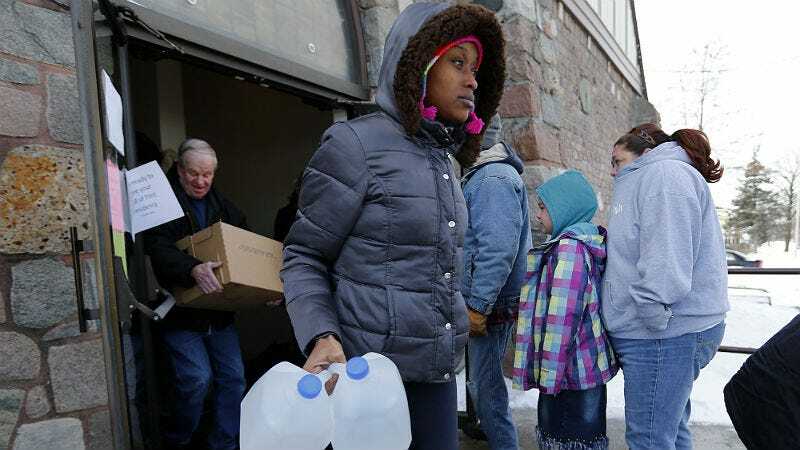 In Michigan, Governor Rick Snyder has declared a state of emergency regarding the water crisis in Flint, Michigan where, due to deliberately careless resource management, the number of kids with dangerous levels of lead in their blood doubled in 2015. Sender’s announcement follows Flint Mayor Karen Weaver’s state of emergency declaration: she called the lead poisoning crisis a “manmade disaster” in December. In 2014, Flint changed its water source from Detroit’s mess of a water system to the nearby Flint River to save money. By April, residents began complaining of cloudy, foul-smelling water, but were assured by local authorities that the water was fine. It wasn’t. Financially, Snyder’s declaration means Michigan state funds and recovery organizations will work with those in Flint to help out, according to Time, but exactly how the state will do so is unclear. Lead poisoning is no joke; neither are the side effects, which include skin lesions, hair loss, chemical-induced hypertension, vision loss and depression. Elsewhere, the Environmental Protection Agency is working with federal prosecutors to investigate the decisions that led to Flint’s public health emergency. In November, Gov. Snyder, the state of Michigan, the city of Flint and 13 additional public officials were named in a lawsuit brought by Flint residents say they knew about the lead poisoning but distributed the water anyway. Last week, Michigan’s lead environmental regulator quit, and Snyder has apologized. At this point, apologies don’t matter.